angelheadedhipster has no other items for sale. 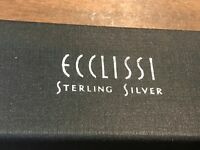 Vintage Ecclissi Sterling Silver Byzantine Bracelet Watch Runs Nice!! Payment is expected within three days of the auction's end unless you've made other arrangements with me. If you'd like to mail payment rather than using Paypal, you can contact me to make arrangements. Delivery confirmation is always used, and a signature confirmation will be required on packaged valued at over $250.00 International Bidders: Please make sure that your address is entered correctly in the Paypal system! If it isn't verified I will not ship.